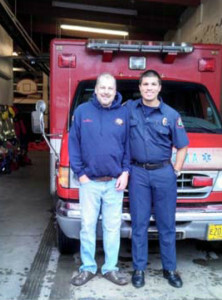 John Forest has been employed with the Clatskanie Fire Department since July of 2007. He faithfully performs janitorial tasks for the Fire Department three days a week, which includes sweeping and mopping the bay and building, cleaning sleeping quarters, bathrooms, and the kitchen, and maintaining the outer grounds. The Clatskanie ﬁreﬁghters frequently comment that John is a hard worker, dependable, and an all‐around great addition to their team. In the last six years, John has only missed work once due to an unavoidable personal situation. The Clatskanie Fire Department has dubbed John an honorary ﬁreﬁghter, and he is often invited to hang out with the guys to watch sporting events. The ﬁre department team has become an important and unique part of John’s social network. Another thing John loves about his job is that it allows him the ﬁnancial ﬂexibility to go on his own vacations and to attend Blazer and Mariner games. This past year John used some of his work earnings to go to the Wildlife Safari in Roseburg, and then on another trip to Newport to the aquarium. He said he loved going on his own trips, independent of the others with whom he resides, and loved being able to take along one of his favorite staff. John is proud to be an active, contributing member of his Clatskanie community and of the Clatskanie Fire Department, and excited about being able to pursue his travel and sports fan dreams. K’Lyn is an energetic, outgoing and personable young lady who joined the St. Helen’s Vocational Program in April 2013. She was eager to ﬁnd employment from the get go; incredibly motivated to get to work. She and her job coach began pursuing multiple opportunities, but honed in on her primary interest: to work at the local Feed & Seed. K’Lyn and her job coach were determined, returning to the business numerous times, making contact with staff and the owner, expressing her interest. During one of these visits, she was offered a position as Shop Helper. Her duties include dusting shelves, ﬁlling bags with seed and keeping the stock room neat and tidy. A few months into her employment K’Lyn had to have surgery on her foot, which required her to use a wheelchair for a period of time. 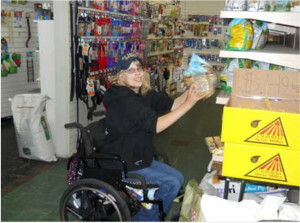 Her doctor gave her a release to work, and with the encouragement and support of her job coach, she succeeded in not letting the wheelchair hold her back from completing her tasks, including vacuuming and stocking. K’Lyn found inspiration in others in the St. Helen’s Vocational program who are successful in employment, and who utilize wheelchairs in their everyday lives. She learned that anyone and everyone who wants to work can work. This knowledge further built her conﬁdence, which she has carried with her into her job at the Feed and Seed, and in her pursuit of additional employment, as she would like to increase her hours. K’Lyn’s experience of working at the Feed & Seed has given her the opportunity to make new connections, friends and has given her a stronger sense of pride. Jace Sakamoto is an incredibly charismatic man who joined the St. Helen’s Vocational program in July of 2013. He is one of those individuals who, the second you meet them, not only inspires you, but also inspires every person they meet. Jace is not only charming, he is also incredibly kind, and has a heart of gold. Jace has created his own fundraising niche in CAS. From the get‐go, Jace asked to assist with CAS activities, with initial focus on the company picnic, as the plans for this event were heavily in the works when he ﬁrst joined the program. Following this, with the support of his job coach, Jace started visiting local businesses, given his keen interest in ﬁnding a community based job. As he was visiting businesses, his focus shifted to asking if there were any fundraising opportunities they supported that could beneﬁt the agency’s “Schnoor Fund.” This fund beneﬁts anyone supported by CAS who has a pressing need for something critical that they cannot afford. Once the Executive Director heard that Jace was approaching businesses in this manner, she asked that CAS put him on payroll as Fundraising Coordinator. 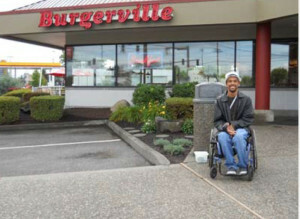 With all his charisma, Jace has already been successful in peaking interest in several local business‐es, with one ﬁrm commitment to date: St. Helen’s Burgerville has agreed to give 10% of all sales from 4pm‐8pm on October 8th to CAS. Jace has prepared to have face painting, crafts and raffle items available at the event as well. Following this, Jace will start preparing for his partnership with Dutch Bros. Furthermore, United Way recently asked Jace to be their Columbia County model for an upcoming poster. Jace readily agreed, and is no stranger to this type of media representation, as he has already been on a poster for United Way in Multnomah County. He is a natural, and loves every minute of it. And, ﬁnally, Jace has been invited to become a Person Centered Meeting Facilitator, another paid position. Following this training, he will be hired to facilitate “Person Centered Plans” for individuals who experience developmental disabilities, to help develop and plan individualized, consumer driven plans that include community employment, relationship building, and the pursuing of goals and dreams. Jace is a true inspiration. He does not allow anything to hold him back from what he wants to accomplish, and somehow always manages to ﬁnd a way to help others as he travels down his path to success.